An original and challenging examination of how to transform post-Sovietological study of Soviet and Russian foreign policy into a more integrated part of the Social Sciences and International Relations Theory. 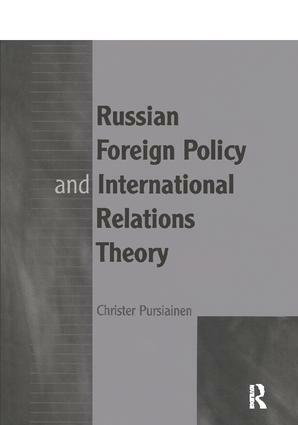 This book represents the first detailed and sustained synthesis international relations theory and Soviet/Russian foreign and security policy in academic literature. Contents: The problem and the argument; How to evaluate theories? ; The heritage of Soviet foreign policy studies; Russia and the international system; Russian foreign policy decision-making; The argument restated: beyond objectivism and relativism; Bibliography. Christer Pursiainen, Senior researcher at the Finnish Institute of International Affairs, Helsinki, Finland. Received his Ph.D. in Political Science from Helsinki University.